I saw the following photo--taken during Anime Expo 2010, according to the lovely ladies over at gamergrrlz.net--last Friday afternoon and decided then and there that I, too, would dress as gay Mario this Halloween. Assuming, of course, I dress up at all. HA! That's amazing...especially the part about the furry boots. Oh, and...the answer to your question (and any question at all) is eBay. Oh, and OF COURSE the answer is eBay! Why did that slip my mind? I don't know if it was the same guy, but some years ago there was a pretty pimp Toad wandering around the convention floor. Dressing up as Waluigi would be fun, especially since it would allow you to say all sorts of snide remarks. I say go for it! This is the best picture ever, it really is. Oh, that's too funny, Jimmy. Thanks for sharing that little tidbit :) Are the other guys friends of yours? Well, that's too bad! 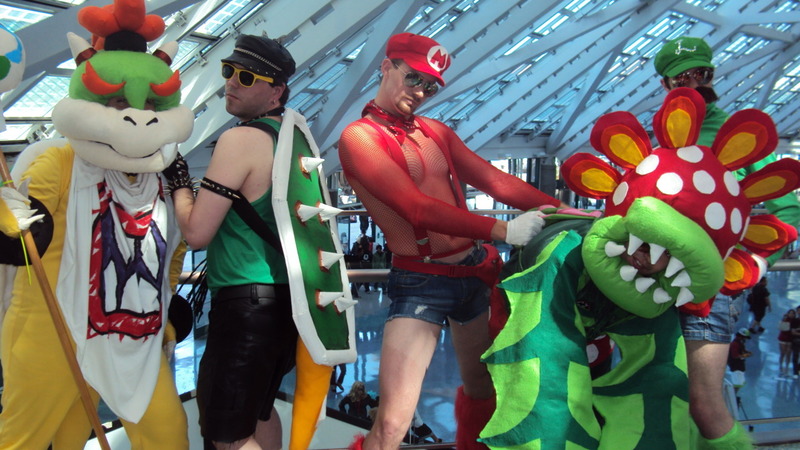 I love that you went as Birdo and Yoshi this year, though. Who will you go as next year? ?